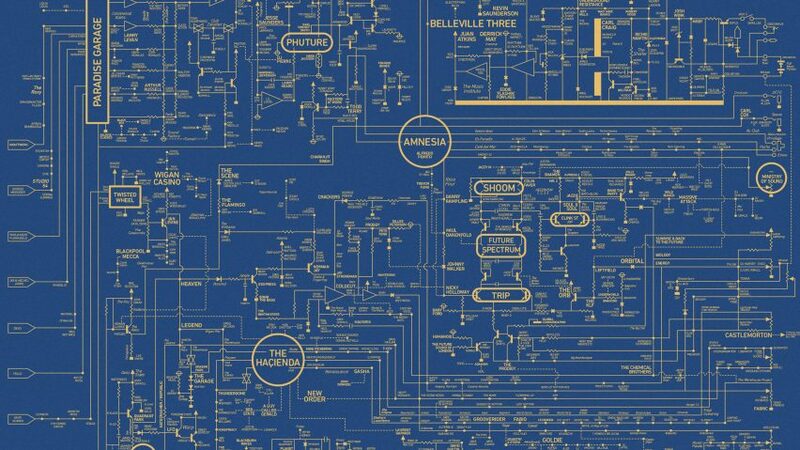 Graphic design studio Dorothy has created a poster that illustrates the history of dance music culture using visual cues that reference the circuit diagram of a bass synthesiser. The Acid House Love Blueprint connects over 900 clubs, musicians, DJs, free parties, sound systems, record labels, radio stations and fanzines that have played a major role in the evolution of acid house and – more broadly – rave culture. The A1 poster is arranged around key scenes, clubs and DJs across the world, including Manchester's Haçienda nightclub and Berlin's Berghain. It is available in blue wit yellow text, and inverted. A part of Dorothy's ongoing series documenting the visual histories of alternative music, including electronic music and hip-hop, the poster is arranged in the style of a mind map, with various names and scenes connected via a selection of bold, regular or dotted lines. When creating the poster – which they described as a "labour of love" – the Manchester-based studio enlisted the help of Ian Mitchell, a graphic designer and regular member of the free party scene in the early 1990s. "He is still very passionate and has a wealth of knowledge about rave culture and its impact on dance music," said Dorothy, who has previously created a selection of posters on London's Wembley Stadium and a series of architectural prints. They also spoke to former Haçienda resident DJs Greg Wilson and Graeme Park, and pulled information from personal experience, books, online articles and blogs. "The whole process becomes pretty obsessive," explained the studio. Earlier this year, graphic designer Rick Banks compiled three decade's worth of nightclub graphics into a new book, in a similar attempt to document club culture. The Vitra Design Museum also put on an exhibition to showcase some of the worlds most famous nightclubs which closes on 9 September 2018.